When help is needed, we try to make use of our position in the region to help. We have, for example, maintained long-term cooperative relationships with social organizations and institutions, which we support either financially or through the efforts of our employees. This has been true for Group sites outside of Jena as well, just as we grow as a company beyond the local region. Jenoptik employees in Jupiter, Florida are active with the organization “Habitat for Humanity”. They are working for affordable and liveable housing – both through financial assistance and their own physical efforts. In the project, employees and their family members helped renovate houses for needy families. Next to this help, Jenoptik donated money to support the organization. As part of the Jenoptik New Year’s reception each year, the company raises moneyfor children who needs special help. The selection of projects is based on the central concern of promoting children and adolescents - be it support for families with sick children, commitment to mentally and physically handicapped children, leisure activities for children with a weak social background or artistic and cultural education and activity of young people. Since 1996, Jenoptik has also assumed the patronage of „Elterninitiative für krebskranke Kinder Jena e. V.“ The organization helps the parents of children with cancer in their time of need, lending them support and hope. Jenoptik sponsors the organization directly but also with personal contributions as well. Our CFO Hans-Dieter Schumacher personally Acts as Patron for the preservation and Long-term securing of the association's work. The Support is varied: own donations, fundraising for Partners, design of children's afternoons and the Promotion of the annual benefit concert of the "Internationale JungeOrchesterakademie" in favor of the association. Jenoptik is a partner in the "Jenaer Integrationsbündnis" and actively supportsist concerns and goals.The Integration Allianceis an associationof various actors from the city of Jena who are committed to improving the living conditions of people with amigrant background in Jena. Particular attention ist paidto opening facilitiesand regular services, and enabling themto take part in civilsociety life. Jenoptik Supports the "Jenaer Zentrum für Familie und Alleinerziehende e.V." 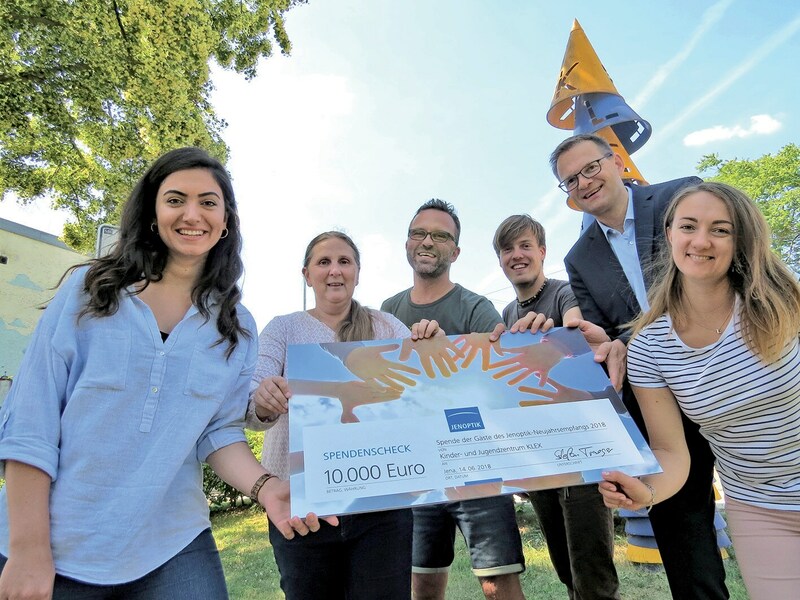 with monetary and material donations in order to continue to offer the possibility of flexible childcare in Jena, thus making it possible to reconcile work andFamily, to study or return to work. Jenoptik supported the European road sefety project "Roads to Respect" in Weimar, which was awarded first price of the European Road Safety Council. As part of the European road safety campaign "Roads to Respect", 25 European studentsdeveloped concepts for improving road safety in their hometown. The student of the Weimar Bauhaus University Daniel Wanzek initiated the transformation ofa pedestrian crossing, which lies in the catchment area of two schools and is thusused by many children.Measures to increase safety also include reducing the speed limit to 30 km/h. In order to discipline the road users without having to pay a fine, the Jenoptik Light & Safety Division provided a speedscoreboard as a free loan.Jenoptik thus contributes to more safety for children on their way to school.